Headquartered in Lafayette, La the 256th Brigade Combat Team consist of the 199th Brigade Support Battalion, 2nd Battalion of the 108th Cavalry Regiment, 2nd Squadron of the 156th Infantry Regiment, 3rd Battalion of the 156th Infantry Regiment, 256th Brigade Special Troops Battalion, 1st Battalion of the 141st Artillery Regiment, and the Headquarters. The Louisiana National Guard’s 2nd Battalion, 156th Infantry Regiment, welcomed its new commander, Lt. Col. William E. Haygood, in an official Change of Command ceremony at Erath High School, April 6, 2014. 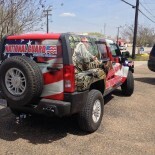 Haygood was commissioned into the Louisiana Army National Guard as an Infantry lieutenant in August 1991 and holds a Bachelor of Arts degree in General Studies. 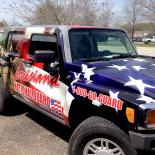 Military images highlight this Louisiana National Guard vehicle shown in photos to the right and above of the newly adhesive vinyl wrap by Pixus Digital Printing. 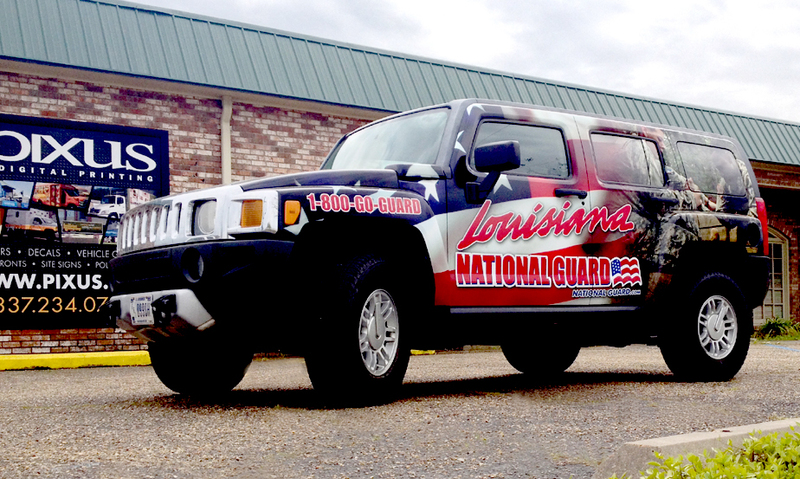 The Louisiana National Guard’s fresh and modern look promises to garner attention wherever it may go. Article courtesy of the Louisiana National Guard.